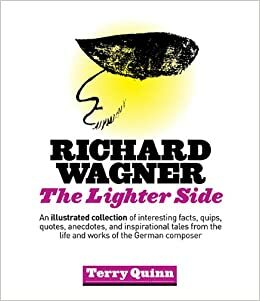 I was interested in Terry Quinn’s book, Richard Wagner: The Lighter Side because of its title. It was intriguing to think that a biography or study might be assembled using Wagner’s humane, even funny, personality – his quirkiness, his climbing trees or standing on his head, his affection for his dogs and his devotion to his family. Unfortunately we have nothing of the sort. The book is a mere assemblage of disconnected anecdotes about Wagner, his circle, and even personages quite remote from the topic. And it is very poorly done. For one thing, there is a lot in it that is simply wrong. Quinn cites (at p. 15) an anecdote related by Ferdinand Praeger in Praeger’s 1892 book, Wagner As I Knew Him, but inserts in brackets that the event took place in 1891 – eight years after the composer’s death. Later (at p. 220) he dates Praeger’s book as written in 1992. Quinn recounts that Franz Liszt died “in Bayreuth not long after leaving the Bayreuth Festspielhaus.” In fact Liszt arrived in Bayreuth, ill, on July 21, 1886, having caught a chill on a drafty train; attended a performance on Tristan on July 25, after which his health deteriorated; and died on the evening of July 30. He relates Cosima’s playing on the Steinway piano that was situated at Wahnfried, in Bayreuth, “only hours before Wager’s death” – in Venice. The leitmotif for the Tarnhelm is a perfect example of Wagner’s genius in creating musical themes that fit the person, object, or emotion. The Tarnhelm motif, played on six muted horns, paints an eloquent picture of something magical, mystical, or just plain spooky. Some critics of the Royal Opera House production have suggested that the jokey Rubik’s cube conflicted with the magical sound of the Tarnhelm motif. The 303-page book has no index. I am surprised to find that this negligible volume is included in the most recent edition of the catalog of the New York Wagner Society for sale to its members and the general public. The keepers of that list are quite discriminating about what shall and shall not be brought to the attention of the Society’s members. In this, as indeed in all things, chaqun à son goût! If you are looking for a book about the lighter side of Wagner a good bet might just be (I haven’t read the book myself so I’m just speculating) “Der lachlende Wagner” by Joachim Kohler. Yes, it’s the same Joachim Kohler that wrote “Wagner’s Hitler” but who has since changed his views completely on the matter. The book is as of now only in German. Peter. I always trust your judgement and I am perhaps one of your most regular visitors, eagerly awaiting your updates, but in this instance I feel you are perhaps being a little “harsh”? Now I admit, I am only at page 90 or so but am enjoying the book a lot. It is mainly alight read – perhaps even more a coffee table book. I would suspect read best simply by randomly selecting a page and moving on from there. although, I am enjoying reading it from page one onward. Yes, it certainly has the odd mistake – which I would suspect are more likely typos than anything else. Alas, this is the third Wagner book I have read this year that could have done with even more detailed proof reading. Indeed, it is actually better than two – one if which is so bad, that although I enjoy the analysis I am simply too exasperated by the typos to continue with – and this is coming from the king of the typo! I am on the second “act” now and am certainly noting an organisational structure – if I think, a deliberately lose one. In many ways, it has the structure of a website. Its very “new media”. Yes, the repetition in places is certainly noticeable but I think it is no worse then that found in Millington’s new Wagner book. Perhaps a consequence of books with none standard narrative structures? As to Kohler’s new book. Really, after the constant, extreme shifts in his opinion on Wagner does anyone really take him seriously? . Personally, always read his Wagner/Hitler book as something of a satire anyway. Anyway, please keep it up. and for goodness sake Peter, less gaps between posts.